The Rosetta Technologies 184 Series combines MICR and spot color capability and high-speed production printing to make it the new leader in its class. 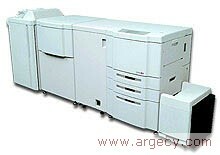 The 184 Series employs an integrated design for efficient throughput in black, MICR and spot color printing. Red, blue and green toners and developer are available for spot color applications. The color developer units are easy to change, so the printer is ready to print when you are. For ease of operation, the printer functions as a single unit, with an included external controller, the RT Server, that intelligently queues and tracks your complex print jobs. With a monthly duty cycle of up to 1.6 million pages, this robust printer is capable of handling production volumes with proven performance and reliability. The 184 Series is ideally suited for producing a variety of MICR and standard documents. This versatile printer handles booklets, direct mail, invoices, statements, fliers and large size pages easily. The printer is particularly effective at producing secure MICR documents; for example, checks, vouchers, and coupons are printed with superior quality and are backed by Rosetta Technologies' exclusive MICR Guarantee. The recently enacted Check 21 Legislation provides another compelling application. The new law gives "substitute checks"� such as a digital image of a check and copies made from that image� the same legal standing as the original paper check. These substitute checks, known as Image Replacement Documents (IRDs) may be printed at any point during the routing process. The printed IRD contains an image of both sides of the original check and must be printed on a MICR printer. The 184 Series is equipped to produce IRDs, at a blazing 184 impressions per minute, to the exacting standards required. If production volume and fast throughput are your main requirements, then the RT 184M with an industrial strength engine and high-speed duplex printing is the best solution for you. The RT 184 is able to handle production volumes month in and month out. Two- or three-shift workloads have minimal impact on spares and consumables utilization. And peak production runs with above "normal" volumes are well tolerated. Production printing often means mainframe output, and Rosetta offers solutions for easily converting AFP/IPDS or Xerox Metacode data streams to PostScript. Network printing from the Windows and Macintosh operating systems. Rosetta Technologies, a recognized leader in the industry, understands the demands involved in developing quality MICR solutions. Rosetta's team of engineers possesses an unparalleled knowledge of the electro-photographic process and its relationship to MICR printing. The MICR RT 184 is a result of this expertise and their endless pursuit of excellence. MICR Guarantee Guaranteed ANSI and ABA acceptance standards if using Rosetta Technologies' approved check stock, supplies, MICR font, and authorized service. Ricoh is a registered trademark of Ricoh Company, Ltd. DDP and Digital Document Publisher, DDP 70, DDP 70e, DDP 92, DDP 184 and VPT are trademarks of Ricoh Corporation. All other trademarks and registered trademarks are property of their respective owners. Specifications are subject to change without notice. This information is for general guidance only. Product configurations in photographs may contain separately priced options. Rosetta Technologies provides nationwide on-site service. Our dedicated staff of service technicians is available 24 hours a day, seven days a week to ensure maximum printer productivity. Expert MICR verification services are also available. Our highly trained technicians will analyze your sample output and provide detailed reports on MICR signal, character formation, formatting, etc. We also offer a broad assortment of supplies, MICR and non-MICR toner, secure blank check/pressure seal stock and post processing equipment. Ask about our comprehensive, cost-effective supplies programs that take the guesswork out of budgeting. Call us today, start saving money tomorrow. Quality MICR supplies are a crucial part of a complete MICR printing solution. Our MICR toner and developer are engineered to provide superior MICR performance with the 184 Series printer.